Walk along any stretch of the Northwest’s rocky coast before 2013 and you were sure to see bright purple and orange clinging to the shore’s igneous monoliths. 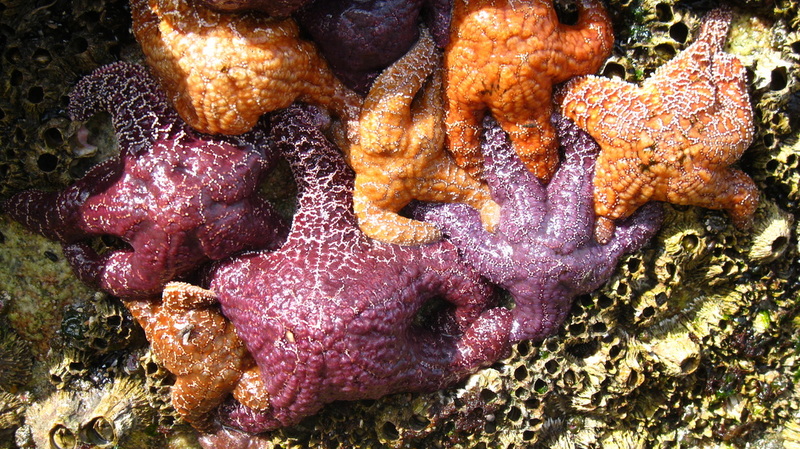 Pisaster ochraceus, or Ochre Star, is the species often associated with the intertidal zones from Alaska to Mexico. If you have gone back to the coast since then, you may have noticed how much harder it is to find the beautiful sea stars. The Ochre Stars are suffering an epidemic, which, in some cases is killing up to 90 percent of the local population called Sea Star Wasting Disease. In 2013, scientists began to notice lesions on Ochre Stars. These lesions were soon followed by significant decay of tissue, then by the loss of limbs and finally death. The disease spreads quickly among populations and can kill an organism in a matter of days. Sea Star Wasting Disease has been documented since the 1970s. There have been other outbreaks along the West Coast since then, but the most recent has been the most significant in its geographic spread and magnitude; The disease is now significantly impacting over 20 different species of sea stars between Alaska and Mexico. The disease linked to a densovirus. Recent studies have attributed the wide spread nature of Sea Star Wasting Disease to warmer ocean temperatures, which increases the rise of illness. So why should we care about such an insignificant part of our shores? Ochre Stars are not just a beautiful five armed invertebrates; they are considered a keystone species, an “animal that plays a unique and crucial role in the way an ecosystem functions.” Often, the animals that fill this role in their ecosystem are unassuming. Not only does “keystone species” apply to the role Ochre Stars, it is because of the sea stars the term was originally developed. Robert Paine first published the term in 1966 after his research on the top predator in the Pacific Northwest intertidal zone, the Ochre Star. He “observed that the diversity of organisms in rocky intertidal ecosystems declined as the number of predators in those ecosystems decreased. He hypothesized that some of these consumers might be playing a greater role than others in controlling the numbers of species coexisting in these communities.” His research found that sea star populations were directly or indirectly tied to the success or failure of a vast majority of species in their ecosystems. The effects of the removal of a keystone species are incredibly far reaching. Ochre Stars in inter and sub tidal zones across the West Coast eat sea urchins. As sea star populations decrease with the spread of Sea Star Wasting Disease, there are fewer sea stars to prey on the sea urchins. With less predation, sea urchin populations grow but their main food source, kelp, cannot support their expanding population. “Kelp forests house a menagerie of organisms that depend on it for shelter, protection, and food.” They support everything from marine mammals, to fish and invertebrates to a wide variety of birds. So as kelp forests are consumed by urchins, thousands of acres of lush marine habitat are lost. And must of that is due to Sea Star Wasting Disease.